Get SCUBA certified, conserve precious coral reefs, and stretch out on the beach! Students over 18 on Loop Abroad’s programs in any country June 15 – July 1 OR June 29 – July 15. No previous experience required. One week of SCUBA diving and tropical island living on the beach. 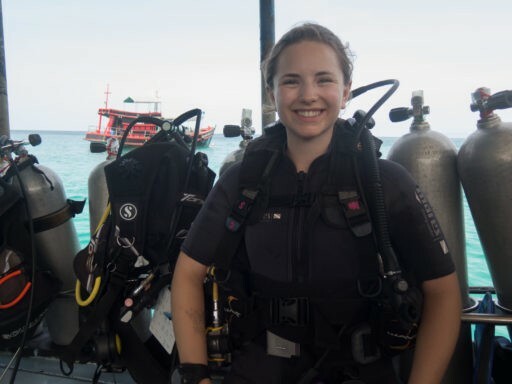 Learn how to SCUBA dive, practice identifying tropical fish, check coral health, and join in marine research and conservation projects. 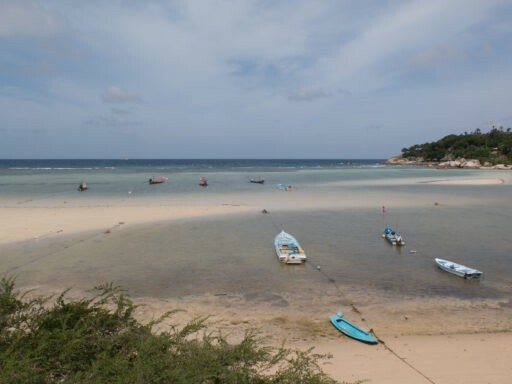 The New Heaven Reef Conservation Program is on Koh Tao island in the Gulf of Thailand. It’s known throughout Thailand for its work in marine conservation. The center – where we will stay – is nestled in a quiet bay on the beach away from the main town and night life because we’re here to focus on exploring and conserving the coral reefs, cleaning up the ocean, learning from experts about this spectacular but threatened ecosystem, and having a wonderful time living on a beautiful island. 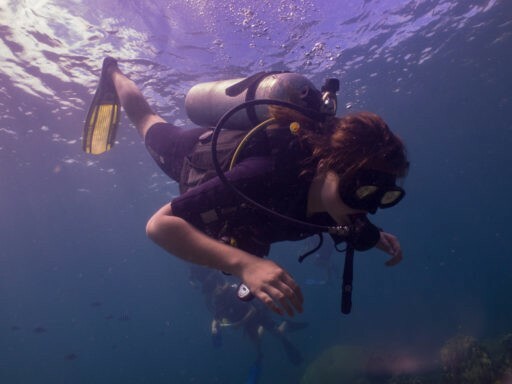 SCUBA certifications are offered through Scuba Schools International (SSI). If you have questions about receiving college credit for this certification, please contact us. 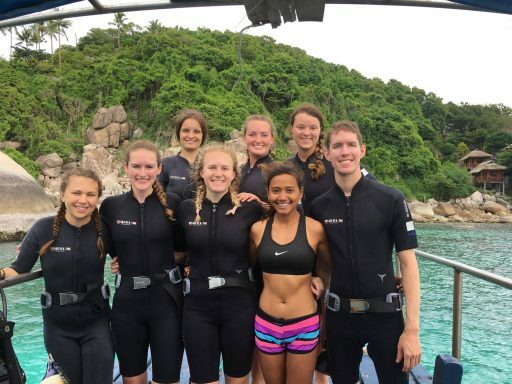 As long as the weather and visibility are good, all students can expect to enjoy 5-6 SCUBA dives this week. 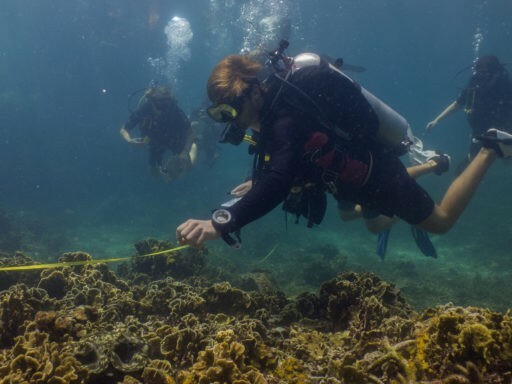 Your group will have up to 16 participants, one Trip Leader, and the New Heaven Reef Conservation Program instructors. Please note that this is a sample itinerary and is subject to change based on weather, tides, visibility, animals and ecosystems in need, and other factors. Sunday: Say goodbye to your program group in Chiang Mai and meet with your new Marine Bonus Week group. Travel to Koh Tao (combination of plane, bus, and ferry). This may include an overnight stop before you reach the island. Sunday: International departure day! Wrap up and reflections in the morning, relax and pack, lunch, and airport departure. Groups will return to the US on final program date, plus or minus one day depending on time of departure. Above water, Koh Tao is a small but busy community of divers and visitors. It’s a beautiful and exciting place to be, but it’s important to stay with your group and watch your belongings, especially considering we’ll be loading or unloading the boat every day! Tuition is $1,950 and is all-inclusive: all meals, housing, activities, lessons, supplies, boat transport, and roundtrip transportation from Chiang Mai to Koh Tao and back. The Marine Bonus Week does not qualify for a 10% tuition reduction when added to a program. Financial aid is not available for the Marine Bonus Week. Choose any two-week program for June 15 – July 1 OR June 29 – July 15. Then choose “Marine Bonus Week” for July 1-8 OR July 13-21.